Organized by Raimund Bürger and Luis Miguel Villada, both researchers of the Center for Research in Mathematical Engineering, CI²MA, from Universidad de Concepción, the 13th CI²MA Focus Seminar: Numerical Methods for Hyperbolic and Related Problems was held on Monday, July 10 at the Faculty of Physical and Mathematical Sciences. Researchers from Chilean and Spanish universities participated in this event, whose main topic was the analysis of hyperbolic problems and their numerical solution. This meeting was funded by Conicyt projects PFB03 (CMM-Basal), PAI/MEC/80150006, and Fondecyt projects 11140708 and 1170473. The first speaker to present some results of his recent research was Pep Mulet, academician from Universitat de València, Spain. Under the title Derivatives-free approximate Taylor methods for ODEs and their relationship with Runge-Kutta methods, he proposed a numerical method for ODEs which is based on an approximate formulation by Taylor methods with a much easier implementation than the original Taylor methods, for the former only require the functions defining the ODEs (not their derivatives) while high-order derivatives are require for the latter. This presentation was based on recent joint work with Antonio Baeza and David Zorio, from the Universitat de València, Spain, and Sebastiano Boscarino and Giovanni Russo, from Università degli Studi di Catania, Italy. Next, in his talk Finite volume methods for two-layer and two-phase shallow water systems, Enrique D. Fernández-Nieto, from Departamento de Matemática Aplicada I of Universidad de Sevilla, Spain, explained that several geophysical applications, such as submarine avalanches, debris flows and sediment transport can be studied by two-layer and two-phase shallow water systems and that there are several difficulties related to the discretisation of these systems, which can be written under the structure of a hyperbolic system with a conservative term, a nonconservative product and source terms. In turn, High-order numerical schemes for one-dimensional non-local conservation laws is the name of the talk presented by Luis Miguel Villada from CI²MA and Departamento de Matemática at Universidad del Bío-Bío, Concepción,Chile, and it focuses on the numerical approximation of the solutions of nonlocal conservation laws in one space dimension. These equations are motivated by two distinct applications, namely a traffic flow model in which the mean velocity depends on a weighted mean of the downstream traffic density, and a sedimentation model where either the solid phase velocity or the solid-fluid relative velocity depends on the concentration in a neighborhood. This talk was the result of joint work Villada developed with Christophe Chalons (Université Versailles Saint-Quentin-en-Yvelines, France) and Paola Goatin (INRIA Sophia Antipolis - Méditerranée, France). Later on, Natalia Inzunza, student of the Master in Mathematics with a minor in Applied Mathematics of Universidad del Bío-Bío, presented Convergence of an implicit-explicit scheme for a two-dimensional parabolic-hyperbolic system which describes results from a joint work with Luis Miguel Villada, her thesis advisor. The talk was focused on the convergence of an Implicit-Explicit Finite Volume scheme arising from discretisation in the parabolic-hyperbolic coupled system describing the competition of predator and prey populations in two dimensions. The system proposed consists of a conservation law with a non-local and non-linear flow for predators, together with a parabolic equation for the prey. 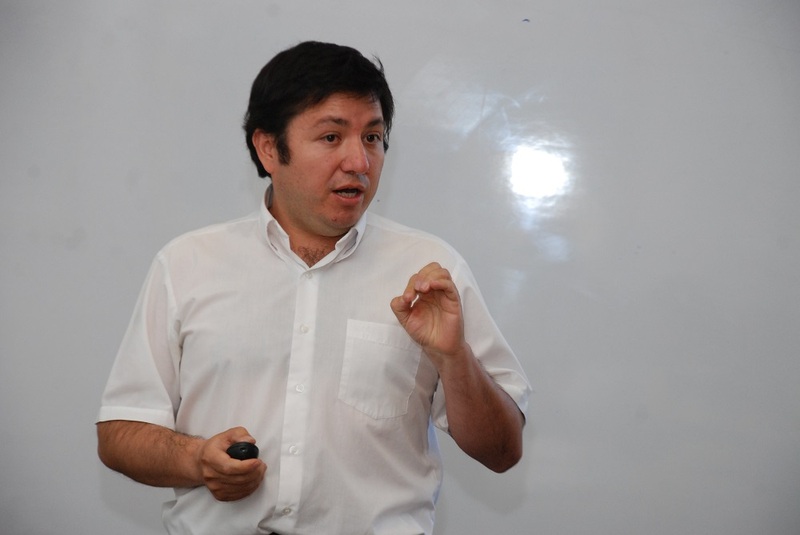 The seminar continued with the participation of Aníbal Coronel, academician of Universidad del Bío-Bío, Chillán, Chile, who presented Convergence of a second-order level-set algorithm for scalar conservation laws, paper in which studies the convergence of the level-set algorithm introduced by Aslam for tracking the discontinuities in scalar conservation laws in the case of linear or strictly convex flux function. This contribution is a joint work with Mauricio Sepúlveda. Then, the CI²MA research asistant Julio Careaga gave the talk Inverse problem of a scalar conservation law modelling sedimentation in vessels with varying cross-sectional area in which he stated that sedimentation of an ideal suspension in a vessel with variable cross sectional area can be described by an initial-boundary value problem for a scalar nonlinear hyperbolic conservation law with a nonconvex flux function and a weight function that depends on spatial position. The sought unknown is the local solids volume fraction. Solutions exhibit discontinuities that mostly travel at variable speed, i.e., they are curved in the space-time plane. This work has partly been inspired by the inverse problem development and it is based on recent joint work with Raimund Bürger (CI²MA and UdeC) and Stefan Diehl (Lund University, Sweden). Furthermore, Mauricio Sepúlveda (CI²MA and UdeC) presented On exponential stability for thermoelastic plates—a comparison of different models in which he considered different models of thermoelastic plates in a bounded reference configuration: with Fourier heat conduction or with the Cattaneo model, and with or without inertial terms. Some models included in the presented study exhibit exponential stability, others are not exponential stable. Finally, Raimund Bürger (CI²MA and UdeC), presented Non-conforming/DG coupled schemes for multicomponent viscous flow in porous media with adsorption, in which he held that polymer flooding is an important stage of enhanced oil recovery in petroleum reservoir engineering. He exhibited a model of this process that is based on the study of multicomponent viscous flow in porous media with adsorption, and can be expressed as a Brinkman-based model of flow in porous media coupled to a system of non-strictly hyperbolic conservation laws having multiple components. The discretisation proposed for this coupled flow-transport problem combines a stabilized non-conforming method for the Brinkman flow problem with a discontinuous Galerkin (DG) method for the transport equations. << Back to news list.